If selling were easy, everyone would do it. If complex selling were easy, 45.4 percent of salespeople would not fail to meet quota. And fail they do. In complex selling, you face a tornado of forces that demand the special protection of core selling skills and a defined process. In a complex sale, as many as five or more decision makers and influencers bring their intractable need for personal wins to the sales dance. That alone changes the rhythm. In complex selling, there’s a slew of people and process traps into which you can fall and lose the sale if you don’t know how the prospect buys. How do you learn this? You’ll find many descriptions of the prospect buying cycle among sales consulting firms; some more complex than others. For our purpose, the prospect buying cycle involves three simple stages. Okay. Nothing new or strange here. Awareness. Consideration. Decision. But is it that simple? We don’t think so. You’ve got to follow a sales process that’s well aligned to the buyer’s journey or nothing sells. I want to match up this three-stage buy process to MERGE, the 5-step sales process we’ve been educating on for the past five years. M for Magnify─Study the prospect in advance by doing your research and homework on his buying style, preferences, pain points, and influences on his thinking. Find areas of concern that are top of mind. Prospects only buy when they need to fix, avoid or solve a problem. The more research you do in advance, the better prepared you are. In the Magnify step, where you do all your research, you lay the foundation for success. Remember CEB tells us B2B buyers are 57 percent the way through their buying process before they engage a salesperson. That means your window of opportunity will slam tight before you even get the proposal finished. So you need to track this stage by learning what your prospect is trying to learn. 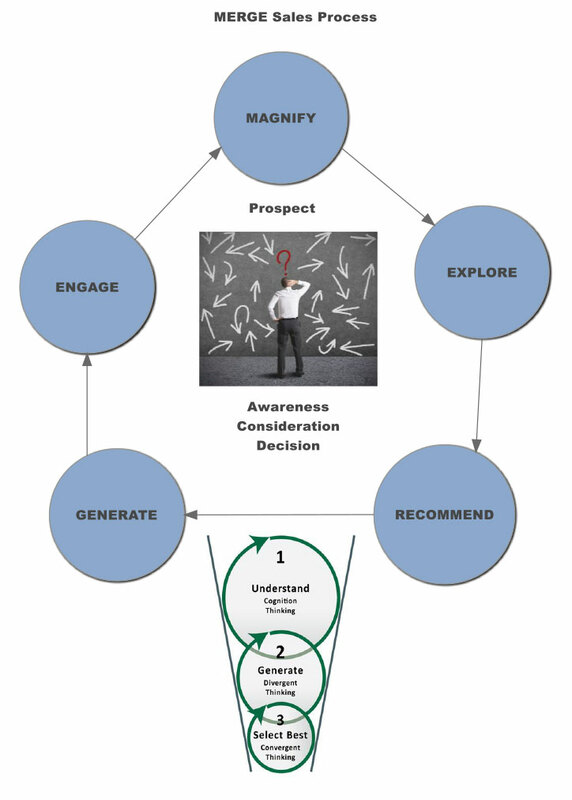 Based on our opening Buyer’s Journey, your prospect is in the AWARENESS stage as you are magnifying. 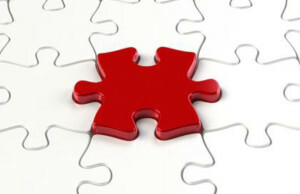 Take magnify time to expand understanding of prospect issues. Use research to formulate thoughtful questions. Discover needs. Begin to diagnose the situation. E for Explore─Every sale demands the seller explore prospect terrain by asking questions, by finding the need behind the need. At this point, you may uncover real needs or, at least, get a better understanding of your prospects and their organizations. As MERGE explains, this stage is much more than the simple collection of data. Exploring is the most important of all selling skills, and it’s particularly crucial in larger, more complex sales. Success depends, more than anything else, on how you handle the Explore stage. Note: Your prospect is still in the AWARENESS stage. Since MERGE released, we’ve observed and collected data on hundreds of sales calls and found at this Explore stage many sales end up in status quo with no decision made. Almost every call involves Explore. Each one of the sales calls I observed over the last few years came up with the same fundamental findings: There were a lot more thoughtful questions in successful calls, those that landed the sale than in those calls which dragged on, were stuck in the sales funnel, and ultimately ended up in no-decision. 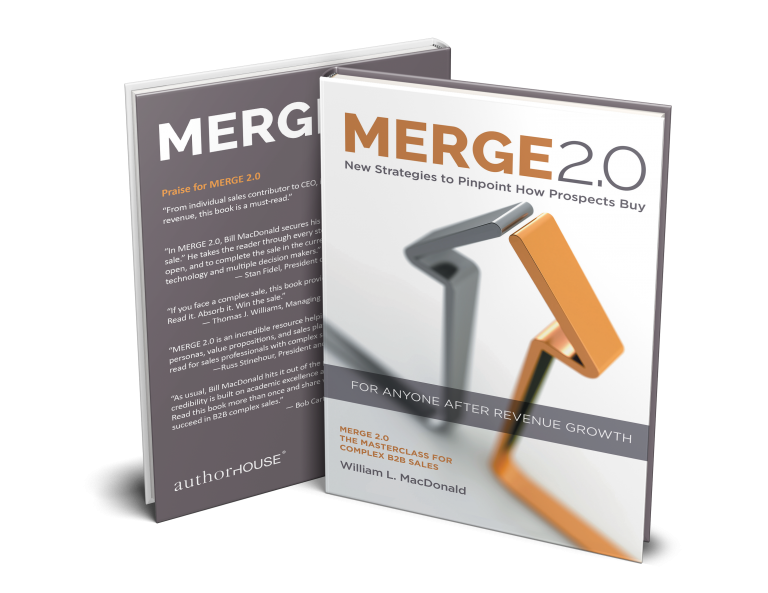 In our data, which we’ll discuss in detail in my new book, MERGE 2.0, simply asking questions is not the key. In fact, asking exploratory questions of the prospect to find out background damaged many sales situations. Prospects were quickly frustrated having to answer questions that the salesperson should have known if he did his homework or understood the prospect’s business or industry. Since MERGE and my affiliation with MHI Global, which emphasizes methodologies like Conceptual Selling® and SPIN Selling®, we’ve learned to appreciate not only the types of questions needed but also the importance of the questioning sequence. By example: Uncovering a problem is not good enough if the buyer doesn’t see the implications of not fixing, accomplishing or avoiding the situation. How many times have you uncovered a need, and had the absolute best solution and have not been able to move the sale to closure? Take time to master the art and timing of questioning. R for Recommend─At this step, you recommend your process for pinpointing possible alternatives to the prospect’s problem, assuming he wants to fix it, which you learned in Explore. Your first sale is to get hired for the consulting assignment. Your process is the magnet. Your process helps the prospect determine which direction is best for his situation. Your goal is direct: to secure a commitment to your collaborative consulting process. Note: Your prospect is now in the CONSIDERATION stage. G for Generate─If you’re going to deliver high value to your prospects, the first thing you need to do is to solve their problems. In this IoT (Internet of Things) world, prospects know there’s more than one solution. In Generate, your job is to generate a process for evaluating all of the alternatives and to have your prospect self-discover your solution. Your prospect continues in the CONSIDERATION stage. So what problems do you solve for your prospects? Selling is about solving problems, whether those are problems prospects are currently facing or problems they will face as their marketplace evolves and their needs change. Let’s pause for a moment and discuss how prospects think about solutions. We learned from the early work at UCLA on human intelligence people deploy several different types of thinking to make decisions, and among the most important are three: cognition, divergence, and convergence. Rational decision making always puts these three types of thinking in the same logical order: first cognition, then divergence, and finally convergence. In cognition thinking, (the Awareness Stage) people seek to understand a situation. That’s why it is important to lead with Magnify and Explore to uncover those areas that are top of mind and that the prospect wants to fix, accomplish or avoid.Too many salespeople uncover the need and go right to the solution and can’t understand why the prospect ends up with no decision.Because experienced salespeople see how their solution fits the buyer’s problem, they often jump quickly to the solutions before the buyer is ready.In contrast, the most successful salespeople we observe hold back and discuss the effects of the problem before talking about products or solutions. Questions about the effect or consequences of the buyer’s problem are important in this phase. In divergent thinking, (the Consideration stage) people consider alternatives. 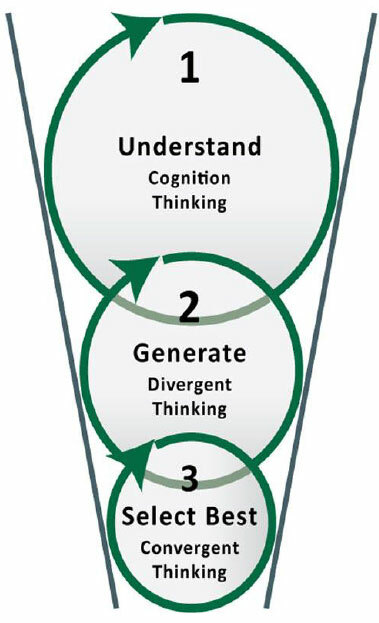 Divergent thinking enables a person to survey the various solutions that may be available.When decision makers brainstorm a problem and research possible solutions, they’re engaging in divergent thinking. The key in this phase is to Recommend your collaborative consulting process and Generate possible solutions. In MERGE, we teach this step as part of your sales process. Align your selling process to how prospects want to buy.You need to lead them to your solution, not lead with it. If done properly and objectively, the prospect will self-discover your solution as the best in the final phase. In convergent thinking, (the DECISION stage) people make the decision. In MERGE, this is Engage. Having analyzed the entire scene and considered the alternative ways of solving the problem, the prospect converges on the solution he/she believes to be the best. Convergence is the final step in the decision-making process, the step when most of our prospects will say, “This is the right solution, or we have made our decision.” If you have followed MERGE, this will be the phase when they self-discover the right solution. E for ENGAGE─In effect, this is your prospect’s DECISION stage and your step in the process where you engage all aspects of the prospect’s experience, in particular, to reinforce your value proposition. As is often said, the real work begins once the sale is made. So at the Engage step, you help the prospect believe he has made a wise decision, and you begin to demonstrate the depth and breadth of service and support to which he can become accustomed. We’ll pull all this together in one “simple” diagram. World-Class Sales Teams Know Why Customers Buy: Do You? Tough to Close Complex Sales? It’s Your Thinking.